I Am Walt Disney is a new release in Scholastic Books' "I Am" middle grade biography series. This particular title does not release for another month but I just had to go ahead and tell you about it TODAY. Why today? Because today, December 5th, is Walt Disney's birthday (1901). Now, I didn't accept this book for review with Disney's birthday in mind. Rather, I like what I know about the guy and I wanted to introduce my kids to the man Walt Disney and not just his brand. Up to this point, I had not read any biographies to my kids. All lives not being idyllic, I just feel like waiting to share stories of people in history until they are old enough to grasp the different trials that people can face in this life. (Yes, we read fiction books with trials and tribulations and I'm aware that I'm not being entirely consistent. But when you know that something is real and actual people are involved it can make you nervous reading their stories.) That said, I figured Walt Disney's child-geared biography was a good one to dabble with. If you are wondering (like I was) if Scholastic could paint an accurate picture of a person I would venture a guess that the answer is 'no.' There is definitely a political slant in this book which I do not care for at all. That said, my oldest bookworm and I enjoyed our time together reading this book. The "I Am" in the title makes you think that the book is written in a more autobiographical style and the introduction of the book is laid out as such. However, from the first chapter on, the book is biographical in nature. In I Am Walt Disney we learn about his childhood, his education, his career struggles and, of course, the successes. 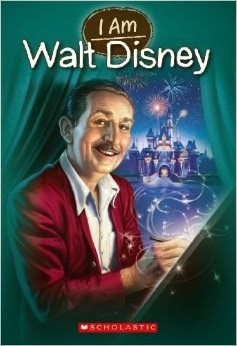 There are illustrated pictures scattered throughout the book as well as photographs of Walt and other historical items. We learn a little about the evolution of animation and the history of Disney Studios. It is a quick look at a very famous man and made the idea of Disneyland an even more fantastic one to all of my kids who each enjoyed looking through the pictures in this book. "For all the joy that Walt Disney spread around the world, you might assume he had a happy, carefree childhood. In fact, Walt's early years were often a struggle. This book talks about how abusive Elias was and how he "didn't approve of . . . silliness." We also learn about how Elias bough a paper route business and employed many school-aged boys to deliver the papers. Walt also worked on the paper route but, according to the author, "did not earn a penny" for his efforts. However, later on in this same book it talks about how when Walt was building up his business, he wrote to his parents asking for the money he had saved up. Now, I've read one biography of Walt Disney (linked) which fails to mention a horrendous relationship between Elias and Walt. After finishing reading I Am Walt Disney I checked various websites and they collectively agree that Elias could be a "stern man" who did have a temper. He was strict with his kids and saved the money that Walt made on the paper route, not trusting him to understand the value of money. In other words, Walt did earn money for his paper route - it just wasn't given directly to him. His father saved it for him on his behalf. As it turns out, that money ended up being used for something useful and I don't think Walt complained too much when he needed some capital. I'm taking issue with the author of this book who paints Christians out to be strict fuddy duddies who hate having fun and who are almost by their very nature brutes and louts. I am not convinced that Scholastic has proof of bad blood between Elias and his son. What is clearly obvious is that Elias did, in fact, have a strong work ethic and that he taught (all of) his children how to put in an honest and hard day's work. I dare say this served Walt quite well. I really admire Walt Disney (precisely because he had a good work ethic which helped him to turn his imaginations into realities!) and I'm glad for my kids to know more about him. I really don't think I'll be hanging onto this book because of the offensive anti-Christian slant it takes right out of the barrel. I'll look for a better biography to share with the kids. Then, when they are older, I fully intend to encourage them How to Be Like Walt . . . while maintaining their faith with all of their mind, heart and strength. Contrary to popular opinion, fun AND success can be synonymous with Christianity. Thanks to Scholastic Books for providing a copy of this book in order to facilitate this review. I received no additional compensation for this post and, as is always the case, all opinions are my own. I have never read a biography of his, but it would probably be an interesting read. I wonder why this one felt it had to portray his upbringing with a negative slant at church-going and strong work ethics. We read a Walt Disney biography from the Childhood of Famous Americans series. It told of Walt earning money and his father (a stern man) never letting him keep it. But they always seemed to have just enough when trying to keep the family a float in hard times. Christianity or the idea that they were Christians was never portrayed negatively. We enjoyed they story and really enjoyed the relationship between Walt and his brother. I think Walt wouldn't have been the same man without his brother.